The seasons are starting to change and as much as I love summer, there are some aspects of autumn that aren't too bad either. I personally LOVE autumn/winter flavours like cinnamon and spices which is why I thought I would try to create a recipe that reminded me of this time of year. In the meantime, here is a recipe for an apple & cinnamon loaf that will warm your soul. In a big bowl mix together all of the dry ingredients - oat flour, sugar, baking powder, cinnamon and all spice (feel free to add more of your flavours spices maybe ginger, cardamom etc). In another bowl mash the banana before adding the other wet ingredients - apple sauce and almond milk. Add the mixture to a cake tin (I used a loaf shape, obviously). Then chop up your apple the way you like and add it on top as decoration or you could make smaller chunks and add them to the mixture before you pour it into your cake tin. Now bake your cake for 25-35mins or until it is completely baked (ovens may vary). Let me know if you recreate this recipe! PS. Did you catch my September Favourites video? Working out in London is amazing. There are so many awesome gyms and I feel like everyone can find an activity that works for them. HOWEVER, it can be really expensive. 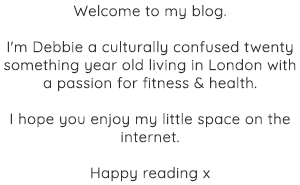 Which is why I thought I would put this blog post together to tell you about some of the really awesome workouts you can do in London FOR FREE. Lululemon doesn't only have gorgeous active wear but they also host their so called 'complimentary sweat' sessions in their Covent Garden, King's Road, Spitalfields and Richmond stores. These sessions are either in the form of a run club or zen yoga and are on Wednesdays & Sundays. These sessions run on a first come first serve basis so you don't really need to plan ahead just be on time (or maybe a little early). The best way to know what is going on is to follow their FB page "Lululemon Athletica London". They upload their complimentary sweat session schedule every week. Nike offer free workouts in the form of both a running club and a training club. For the running club they have coaches and pacers who will run with the group to teach you how to become the best runner you can be. And if running isn't your thing, you can do a training club workout instead which is offered for any fitness level. The classes are obviously free, but you do need to reserve your spot in advance. The best way to know when what is on is to check their website. ASICS offer free bootcamp and running club at their oxford street store every Wednesday at 6.30pm. No need to reserve your spot for this one, just turn up and be ready to get your sweat on. They have recently just created a public FB group that tells you which activity is on each Wednesday, so if this location suits you make sure you check their FB group here. Reebok also offers in store workouts every Tuesday and Wednesday at 8pm in their Covent Garden Reebook FitHub. The workouts vary a little each week but they are going to make you sweat. The best way to know what kind of workout is on is by checking their FB Page: "Reebok FitHub Covent Garden". Also no need to reserve for this one, just show up on time. Have you ever seen people workout together in a park around London? Chances are they are part of Our Park, an organisation that has created loads of free workouts in parks across London. They have any class you could think of, from running to yoga and bootcamp - they've got it all. You do need to register for these ones. Best is just to go to their website and find a workout that suits you time and park wise. I am sure there are waaay more free workout gems out there so if you know of any I haven't mentioned please let me know down below! Working out when you don't have access to the gym or any classes can be hard. But home workouts can be just as effects and fun. I love watching workout videos online to help me get through a home workout when I don't have the means to get to the gym. Which is why I have created two of my own! Get some of your favourite music blasting and work through these videos below. Would you like to see more workout videos on my Youtube channel? The Great British Bake Off is back (yay!) which means I want to BAKE! If you've been following me on instagram (@debbieariella) you might have noticed that I've been trying more vegan and plantbased recipes and meal ideas during the last few months, so I thought I would try to make some vegan muffins in celebration of the Bake Off! Also if you can watch the Bake Off without stuffing your face with cake I applaud you. Try this simple Raspberry Muffin Recipe on Wednesday so you have something delicious to eat while we all watch Mary Berry. Mix together the sugar, agave & almond milk before sifting in the flour and baking powder. Make sure not to stir the mixture too much once the flour is added. Grease a muffin tin and add one table spoon of mixture to each container. Add a few raspberries to each muffin before topping it with more muffin mixture. Then place the muffins in the oven for roughly 15 minutes or until they are golden brown. Once they are out of the oven, let them cool a little and sprinkle them with some powdered sugar for decoration (and extra sweetness haha). Now all that is left is to enjoyyyy!